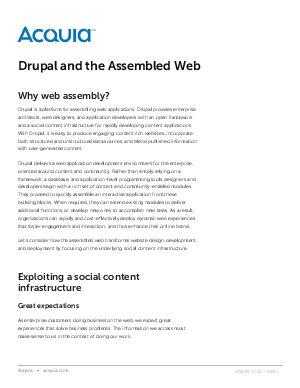 Drupal is a platform for assembling web applications. Drupal provides enterprise architects, web designers, and application developers with an open framework and a social content infrastructure for rapidly developing content applications. With Drupal, it is easy to produce engaging, content rich websites, incorporate both structured and unstructured data sources, and blend published information with user-generated content.